Can you identify the people on the porch? 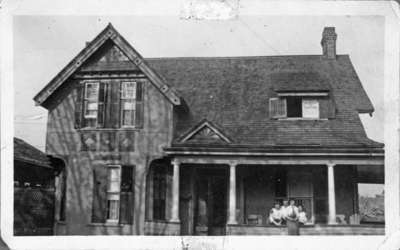 A black and white photograph of the residence of D.E. Heard with people standing on the verandah of the house. This house was located on the east side of Brock Street north, between the Royal Hotel and the Hewis block, and was the residence of the Pringle and later the Heard family. In 1928 it moved to the southwest corner of Brock and Mary Streets. Residence of D.E. Heard, 149 Brock Street N. moved to 158 Brock N., 1912, Photographer Unknown. Whitby Archives 17-048-002.